Here is a summertime recipe that I enjoy making, either with fresh shrimp or scallops. The reason that I like this recipe is because it’s a quick and nutritious way to prepare a summertime lunch or dinner meal. 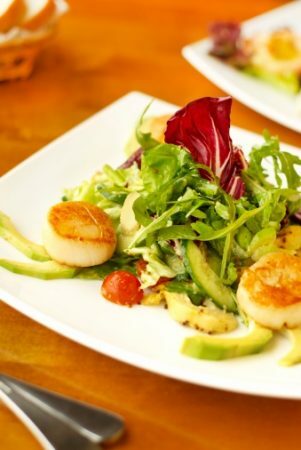 Scallops are a very good source of high-quality protein, essential fatty acids, and trace minerals like selenium. This recipe also has various types of vegetables, garlic, and herbs that contain various phytochemicals that are important for cardiovascular health. Adding avocado and extra virgin olive oil to this healthy salad provides a great source of omega-9 fats, which are also important to lower cholesterol, inflammation, and blood clotting. This is a salad that can be served with your favorite whole grain or fresh fruit, and can also be marinated for 30–60 minutes before serving. 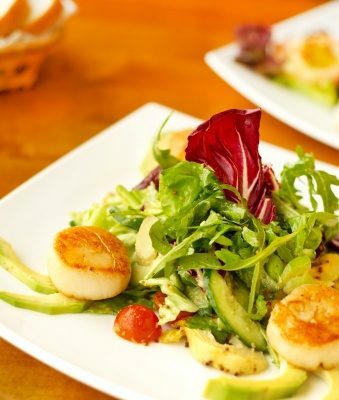 In a large bowl, mix all the ingredients together and serve on a bed of shredded romaine lettuce.